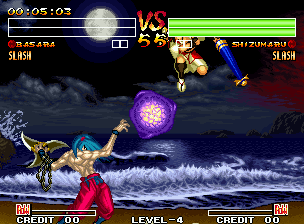 After Samurai Shodown 3 went darker in terms of animation, attitude, and gameplay, SNK returns with the four version of this famous weapon-based saga. Amakusa has a plan stored up in his castle and it is up to Haohmaru and friends to travel through the many areas of Japan to reach Amakusa�s lair. I would talk about when this took place, but I think everybody are as confuse in this series� timeline as I am. One thing that throws off the game is the time limit they added to the single arcade mode. Depending on whom you choose and what difficulty option you have selected, you�re to reach Amakusa�s lair before the desired time expires or else you will get a quick, yet bad ending. If there was an option to let you choose a time limit mode, that would�ve been okay, but since it not, it makes you feel like you are being force to rush and finish the game. Where�s the fun in that? As always, the AI will let you off a few easy wins early on, but nearing the end, the computer�s intelligence will awaken. Be hopeful you don�t have to deal with Kyoshiro at all, he can be a pain in the buttocks like he was in SS3 and in this, he really knows how to be a total time waster. Everything from the last game, like the initial button attacks and tactics, is back and just as fun, but there are a few exceptions. Personally filling up your POW meter and air-blocking (which I was a fan of) were scraped. There is also no more food or bombs being randomly thrown in fights anymore. You can recover some energy while laying on the ground, but it laughable when you see how much life you get back. As for controls, the buttons and joystick registers fine as does the moves and combos, but tons of the commands have made the game a little more frustrating. For one, fighters� super moves are now perform the same exact way, which shows up on the screen as (Back, Forward, Down + AB). To me, it just doesn�t feel right. New to the game is the combo slash, by pressing C & D at the same time. After it connects, it is followed up by tapping the buttons in a certain order. Do the entire method correctly and you are given an instant full POW meter. Pressing ABC together ignites the �Rage Explosion� that let�s you do an unblockable, but no damage attack. 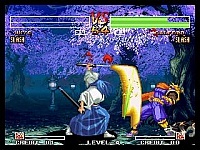 The power meter then becomes a red-orange color bar, so you can perform the combination slash, which able you to end it with a special move or tap BCD together will make you dash forward with a deadly slash stroke and if it connects, will do damage to the opponent by how much energy that person had lose up until then. The bad side is doing this powerful slash will take out the POW meter for the rest of the round. The �no contest� command really doesn�t need to be there, if you can already do regular slashes to slice the opponent�s body in half and such. A feature I did found great was the ability to perform suicide forfeits to lose the match, after giving your opponent the automatic win you are given a full POW meter in the next round. Taunting now comes at a price by challenging your rival to a hand to hand confrontation by putting your weapon down. You can�t deny the sounds of Samurai Shodown still have some of the best music and effects to listen and number 4 doesn�t disappoint or so I have thought. To the interface to the map locations, the soundtrack really shows some unbelievable Japanese instrumental tracks. There is no stage music, instead its most of the fighters who get their own themes. Think how the music was placed in The King of Fighters� 97 and you�ll get the picture how its setup. The sound of the usual slash, cling and clang of the weapons are still there and the newly added voice dialogue is nice to hear. The whole cast from number three returns to this one, with the introduction of two new swordsmen and three returning warriors who hasn�t been seen since the first and second games. New guys, Kazuki and Sogetsu bring the fire versus water rivalry to the game as ninja brothers. Of course Jubei, Charlotte, & Tam Tam got a major makeover and now look like they belong in this version. With the Slash/Bust system you now you have 34 fighting styles to pick form or should I say 33�Tam Tam�s Slash/Bust is really no different except maybe one special move. 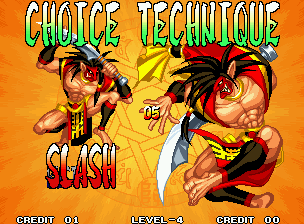 Like in Samurai Shodown 3, after choosing Slash or Bust, you get to choose the three difficulty options. The two player versus is still as fun, but with no air blocking you�ll feel uncomfortable and it doesn�t help the one player mode with no choice but to fight in limited time structure further trashes this party. 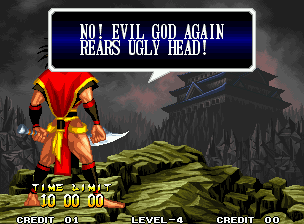 In my honest opinion, I think Samurai Shodown 4 in it�s entirely did came off a little too gimmicky and lacking direction. While it does have it perks, coming off better then SS3 and as much as I am a fan of the Samurai Shodown universe, it�s safe to say that the SNK department tried to put too many eggs in one basket with the special abilities they installed on SS4. While good in its own right, SS4 is not the worst, but definitely not the best of the series.